The Soviets began construction of three defensive complexes at Leningrad in 1960-1961. The US believed that the Leningrad system was originally designed to have a capability against ballistic missiles, and perhaps against aerodynamic vehicles as well. However, the initial design was changed. The West could not initially determine the nature of this change, or whether it was caused by serious technical difficulties, a realization that the system was vulnerable to penetration aids, or important new developments in the state-of-the art. In 1963, the SA-5 Griffon interceptor was paraded in Red Square, and characterized as an ABM interceptor. Western source reporting associated the Griffon interceptor with the Leningrad system, and both were characterized as anti-missile systems. In fact, the Leningrad/Griffon complex was an air defense system. The contemporaneous though unrelated V-1000 anti-missile interceptor was not mentioned in open source reporting, nor was it ever deployed. A totally unrelated missile, the Gammon, was subsequently given the SA-5 designation. When the Leningrad system was first noticed in the West, there was considerable debate over its mission and capabilities. Although the deployed air defense system does have some residual ABM capability, there is now general agreement that it is essentially restricted to an air defense role. In general, its performance seems to be similar to that of the American Nike-Hercules air-defense missile. Griffon two-stage liquid fueled interceptor, which is 16.5 meters long with a range of over 250 kilometers with guidance in the final stage of the radar seeker "Zenith" (Development Research Institute-17) fuze "Neck" (Development - NII-504) for the cruise phase - radio guidance with AP-69B autopilot (developed in DB- 923). The control system was the circular scanning radar complex - RLS-1 FLAT FACE (2 units in a complex, combined with the SAZO-1 identification system designed DB-37 - later - NII-244), missile controlled via UMN (management machine guidance) developed in the SKB-245, the complex could control 10 missiles against 10 targets, with the transfer of missiles teams via the transmission station (SPC, development - NII-17). Work on the concrete foundations for the system's radars was similar to that observed at Sary Shagan, and it was located across the planned flight corridors of US ICBMs. Only 30 launchers were constructed, however, and by 1963 all were dismantled. Soviet writings had emphasized zonal defense missiles as a complement to missile defense of points. Although evidence to this effect dated from 1960, the emphasis was a rational outgrowth of the doctrine of “air defense operations” that evolved during the formation of PVO Strany. It is believed that work on a long-range defense missile, nick-named Griffon, began in the mid-1950’s. Some of the articles published in secret Soviet military journals during the early 1960s dealt with the advantages of developing a long-range SAM system to defend against bombers and air-to-surface missiles (ASMs). Marshal Biryuzov, then commander-in-chief of the PVO Strany, was cited as recommending that long-range anti-aircraft missiles be deployed in "zonal" defense patterns to protect the key industrial regions of the USSR. In commenting on Marshal Biryuzov's recommendation, the Soviet officer who cited him went on to state that the SAM defenses of the USSR should consist of "boundary groupings" of long-range missiles to screen the approaches to vital regions and "point groupings" of short-range missiles to defend important targets in the interior. In 1960 or 1961, construction work was begun on three defensive missile sites around Leningrad. However this construction work ceased in 1961 or 1962, and further work on the system appeared to have been abandoned. In the 1960-62 period, while Khrushchev was still in power, there was evidence of Soviet deployment of an ABM system around Leningrad. This was enough to keep alive American ABM research, and in July 1962, an ABM missile fired from Kwajalein Island in the Pacific intercepted a missile fired from Vandenberg Air Force Base in California. The problems of the ABM were many, however, and McNamara stuck to research and development only, despite pressures from Congress to go ahead with deployment. In National Intelligence Estimate NIE 11-3-62, “Soviet Bloc Air and Missile Defense Capabilities Through Mid-1967” the US intelligence community reported 31 October 1962 that "Our evidence leads us to conclude that the USSR is deploying an ABM system around Leningrad. This system, with facilities resembling some of those first noted at Sary Shagan in 1960, has been under construction around Leningrad since at least early 1961. These installations include three launch complexes of a distinctive type. 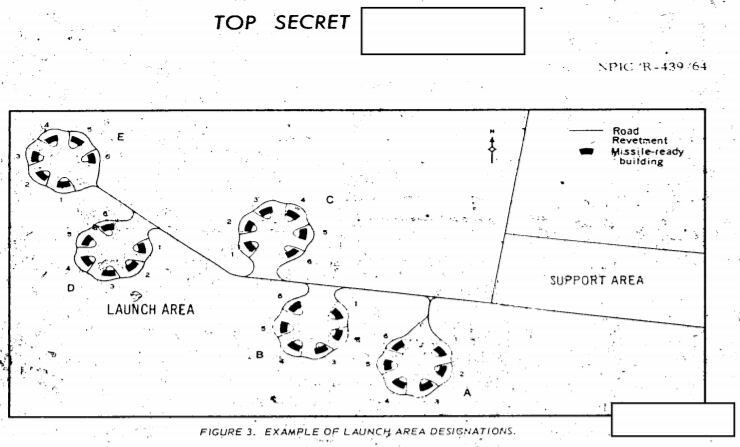 Each consists of five circular launch sites having six positions each, and associated support areas. We do not believe that construction of the system at Leningrad has been completed, but we estimate that it will achieve some operational capability in 1963. "We lack the technical data on components which would be necessary for a firm estimate of the capabilities of the Leningrad system. However, we believe the system has been test-fired at Sary Shagan against ballistic missiles of short and medium ranges, including 1,100 missiles which are the nearest Soviet equivalent in range and velocity to the Thor, Jupiter, and Polaris. We are uncertain whether the USSR has test-fired any antimissiles against ICBMs.. However, the Soviets have almost certainly conducted extensive research on ICBM re-entry characteristics and we believe that they would have concluded that the problems of intercepting IRBMs and ICBMs are not significantly different. For this reason, and considering the nature of the ballistic missile threat to Leningrad, we believe that the system being deployed there is probably designed to intercept both IRBMs and ICBMs. We have no basis for estimating its effectiveness. We think it unlikely, however, that a system deployed at the current stage of Soviet R&D would be effective against missiles employing decoys." The Director, Defense Intelligence Agency, the Assistant Chief ot Staff tor Intelligence, Department of the Army, the Assistant Chief of Naval Operations (Intelligence), Department of the Navy, the Assistant Chief of Staff, Intelligence, USAF, and the Director tor Intelligence, Joint Staff, did not concur in this assessement. "They are concerned that [the NIE] may not give a proper perspective of the operational capability of the Leningrad system. The reader may infer that the system has a capability against the ICBM, whereas this cannot be substantiated. They believe the Leningrad system was developed at Sary Shagan for static or field deployment and has been tested only against target missiles with various ranges from about 300 n.m. up to 1,050 n.m.
"They believe also that the system deployed around Leningrad is to provide a measure of protection against the Thor, Jupiter, and Polaris. When operational, the system should have a capabillty to engage the threat posed by these first generation systems. Any major change in the character of the threat, such as use of salvo fire, decoys, or tankage fragmentation, should have a detrimental effect on the system's capabilities. "One of the more critical judgments to be made is an assessment of the system's potential capability against an ICBM re-entry vehicle. They believe that under certain favorable conditions, the system, as synthesized from the Sary Shagan activity, could engage an ICBM re-entry vehicle. In this connection, we have no evidence that the system has been fired against vehicles with velocities and re-entry angles similar to the ICBM. Furthermore, the record of firing to date suggests that the system probably was optimized against MRBMs. "While an anti-ICBM capability can neither be confirmed nor denied, they conclude on the basis of firing activity and other evidence that the system being deployed at Leningrad ls designed to counter the MRBM/IRBM, and that present evidence does not support the anti-ICBM capability implied in the text." "We know of no installations in the vicinity of Tallin and Cherepovets which would call for this selection as early sites for an ABM system or even for a new SAM system. In order to function as part of an area ABM defense for the western urban-industrial region, the complexes at Tallin and Cherepovets would need to employ a missile with long-range, exoatmospheric capabilities and a compatible acquisition radar. Using a long-range AMM, complexes at these locations could defend against both ICBMs and Polaris missiles on trajectories towards Moscow or other key targets in the western region. To defend Moscow from these locations, intercepts would have to be performed at altitudes of 50 to 200 nm. "These complexes, however, could be intended to serve in a SAM role. If so, we believe they would be for a long-range system, and that they may he the start of a barrier to screen a principal route of US bombers toward the industrial centers of western USSR. The missile used by such a system could be the Griffon or some other missile not yet identified. If used with appropriate guidance equipment, the Griffon would probably be effective to ranges on the order of 100 n.m. against aerodynamic vehicles at medium and high altitudes. "Thus, there is some support for the belief that the complexes are for a SAM system to defend against aerodynamic vehicles. On the other hand, we have noted intensive Soviet research on missile defenses for several years and indications that the USSR has been working toward new and different ABM capabilities. In light of this factor and some of the foregoing considerations, we think there are also persuasive reasons for believing that these complexes are related to missile defense. However, any judgment at this time on their mission is in our view premature." In National Intelligence Estimate NIE 11-3-64 "Soviet Air and Missile Defense Capabilities Through Mid-1970", 16 December 1964, the US intelligence community assessed that "Construction of three new defensive complexes was begun at Leningrad in the winter of 1960-1961. While our evidence has never been adequate to make a firm judgment about the function of the Leningrad facilities, we have estimated for the past several years that they probably comprised an ABM system which would be capable of engaging both IRBMs and ICBMs. Last year we estimated that the Leningrad system might have a capability against a small number of re-entering objects arriving at about the same time (i.e., either more than one missile or a missile with a small number of decoys), but that it would probably have little capability against saturation attacks or sophisticated penetration techniques. "We believe that the Leningrad system was originally designed to have a capability against ballistic missiles, and perhaps against aerodynamic vehicles as well, but that the initial design has been changed. We cannot determine the nature of this change, nor can we determine whether it was caused by serious technical difficulties, the realization that the system was vulnerable to penetration aids, or important new developments in the state-of-the-art. There are similarities between new construction at one of the Leningrad complexes and two recently discovered defensive complexes under construction in northwestern USSR. In light of these similarities, at least these three complexes may now be intended for the deployment of the same defensive system." NPIC arbitrarily assigned a system designators of the launch positions within them at the three Leningrad probable AMM launch complexes to facilitate reference to specific locations, within the launch areas. The launchsites are lettered, "A" through "E", in order,in accordance with their locations along the access road as approached from the direction of the entrance to the launch area. The launch positions within each launch site are numbered 1 through 6 in a clockwise direction beginning with the first position to the left as the launch site is viewed from the access road. The six launch positions at each of the five launch sites appear generally alike, although it was not possible to determine their cornparative! status. 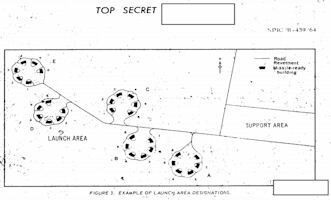 Each of the triangular launch positions was revetted, with a circuitar area, light in tone measuring approximately 25 feet in diameter located at the apex. The centers of these circular areas are dark in tone and wereconsidered to be probable launch points. Some concave in appearance while others appeared to have some height. The missile-ready build-ings associated with each launch position were similar in outward appearance. Each building contained five bays. Shed-like appendages extend from each end of the buildings the side away from the perimeter road. Radials extended part way across the perimeter roads. Cable conduits led from the earth-covered Complex Control Center to the two elevated platforms and also to a radar position approximately 450 feet northeast of the Control Center. In 1964, new construction was observed around the Estonian city of Tallinn. For some time, it was believed that the reason for abandoning the Leningrad system was that it was intended as a dual capable SAM/ABM and that changes in the program related to its lack of capability against a more sophisticated threat as represented by the faster reentry speeds of Minuteman missiles then coming into the US inventory. An extension of this argument was that the Tallinn deployment represented a satisfactory solution to whatever problems may have been encountered with the dual capable system. Richard J. Whalen with the Georgetown University Center for Strategic Studies [not to be confused with Albert "Bud" Wheelon, one of the nation's central figures in the development of the first spy satellite and later the commercial communications satellite], wrote in Fortune magazine, 01 June 1967, "the Russians, heeding their doctrinal imperative of balance between offensive and defensive military forces, began concurrent development of missiles and anti-missiles as early as 1948. By the early 1960's they had built what was apparently the prototype of a defense system aimed against medium and intermediate-range missiles, and they deployed it at Leningrad. U.S. intelligence rated this system capable of handling as many as five targets simultaneously, but it was regarded as ineffective against ICBM's. In a rare secret session of the Senate in April, 1963, Senator Thurmond, of South Carolina, a member of the Armed Services Committee, warned that Russia had an operational ABM system, and he urged that the U.S. proceed at once with the Nike-Zeus, then ready to go into production. "Soon afterward, the U.S. turned to the improved Nike X system .... An "area defense," which would protect several targets at once, would be much more effective, but this kind of ABM requires a long-range missile equipped with a large warhead that can intercept ICBM's above the atmosphere. In 1965 the U.S. began development of such a missile, named the Spartan, which will replace Zeus in the Nike-X system. But by this time the Russians had abandoned the Leningrad ABM and were well along in the development of more advanced concepts. Incomplete and often contradictory information currently available on the Soviet antiballistic-missile defenses bas caused some divergence of opillion within the U.S. intelligence community." In 1969, David E. Mark, Deputy Director For Research, Bureau of Intelligence and Research, noted: "Even when decisions are made to go beyond research and developlment into production and deployment, we find evidences of mistakes, and we can only imagine how many more such costly errors we have not learned about at all. Here I can mention the abortive Leningrad ABM system of the early 1960's which was abandoned a fter much money had been devoted to a start on deployment, and the Moscow ABM svstem which is evidently being curtailed in its deployment below obviously planned levels, apparently because of relative ineffectiveness." In 1969, Morton Halperin wrote "At about the time of the Leningrad ABM reports, the United States had begun to consider how to penetrate such a defense. One result was the idea of several warheads on a single missile. This was the MRV, or multiple re-entry vehicle. Some years later, the MRV was refined into the MIRV, a multiple and independently targetable re-entry vehicle atop a Minuteman ICBM or a Submarine-based Poseidon missile. Thus, it appears that the Soviets reacted to the big American missile lead by beginning an ABM defense, and the United States reacted to the Soviet ABM defense by developing MRVs and later MIRVs." Subsequently, another line of argument was used by some Western analysts to explain the cancellation of Griffon. During the period 1957 to 1961, data on the British Bloodhound long-range air defense system became available to the Soviets through their espionage activities. Existing evidence about the Soviet SA-5 Gammon long-range SAM suggested that a number of features of the Bloodhound were incorporated into the SA-5 system which amended the trend of Soviet missile design philosophy. This explanation of the Griffon cancellation derived from a major redesign which incorporated the British technology. This creative idea derived from the mistaken notion that the GAMMON was a "redesigned" GRIFFON, rather than an entirely new and totally unrelated system. As recently as 1985, the Heritage Foundation reported that "Griffon was deployed at sites stretching in a belt from the Baltic Sea to the Arctic Ocean, covering the northern approaches to the USSR."